Recruits of Alpha Company, 1st Recruit Training Battalion, and Oscar Company, 4th Recruit Training Battalion, practiced the fundamentals of marksmanship February 29 - March 4, 2016, on Parris Island, S.C. Recruits spend a week learning and practicing marksmanship fundamentals before shooting live rounds the following week. The Marine Corps has a proud heritage of marksmanship and teaches recruits that every Marine is a rifleman. —(Photos by Private First Class Carlin Warren). "Every Marine a rifleman," regardless of Military Occupational Specialty (MOS), has been one of the hallmarks of the Marine Corps throughout its history. From the Marine marksmen shooting from the high rigging on ships during the sea battles of the American Revolution, to the battle of Belleau Wood, France in June of 1918 during World War I where Marines hit German targets from more than 500 yards away, to Gunnery Sergeant Carlos Hathcock, a Marine sniper in Vietnam with a service record of 93 confirmed kills, we have set ourselves apart by our shooting prowess. To develop those skills recruits will spend two weeks learning how to shoot the Marine Corps way. The first week is called "Grass Week" where recruits learn the fundamentals and positions they will use. The second week is "Firing Week" where recruits will practice, and then qualify on the Table 1 course of fire, or the Known Distance (KD) course with the M16A2 service rifle. Recruits fire the same M16A2 service rifle that they were issued at the beginning of training and have been carrying to this point in boot camp. The M16A2 is a 5.56 mm, Lightweight, Magazine fed, Gas operated, Air cooled, Shoulder fired weapon. Recruits learn to remember these characteristics of the by the acronym LM-GAS. The M16A2 is constructed of steel, aluminum and composite plastics. 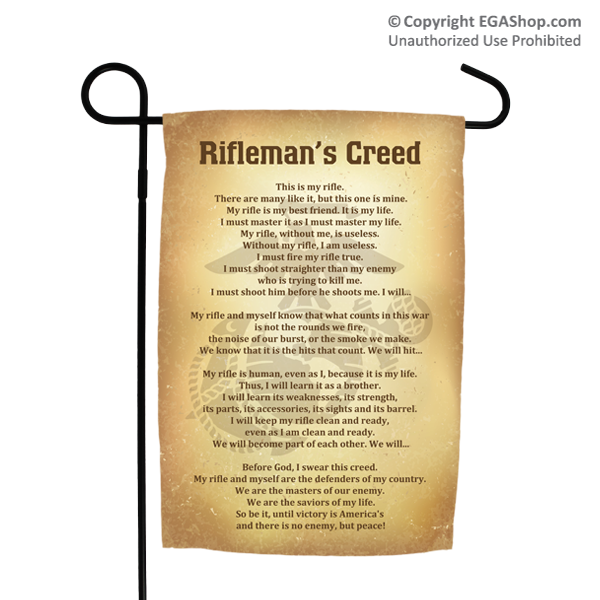 Click to purchase "Rifleman's Creed" Garden Flag from the EGA Shop, where every purchase supports our troops!.